I just wanted to share another nice way we can use the round center hole of the chiffon cake to form the “吉” word! During Chinese new year, we like to wish one another "大吉大利" (translated to "good fortune/luck") so this may be a nice gift or way to wish your family and friends. Some of you may find this cake a little familiar. My first version of the Mandarin Orange “吉” Chiffon Cake was 3 years back and it was one of the first patterned chiffon cakes back then. 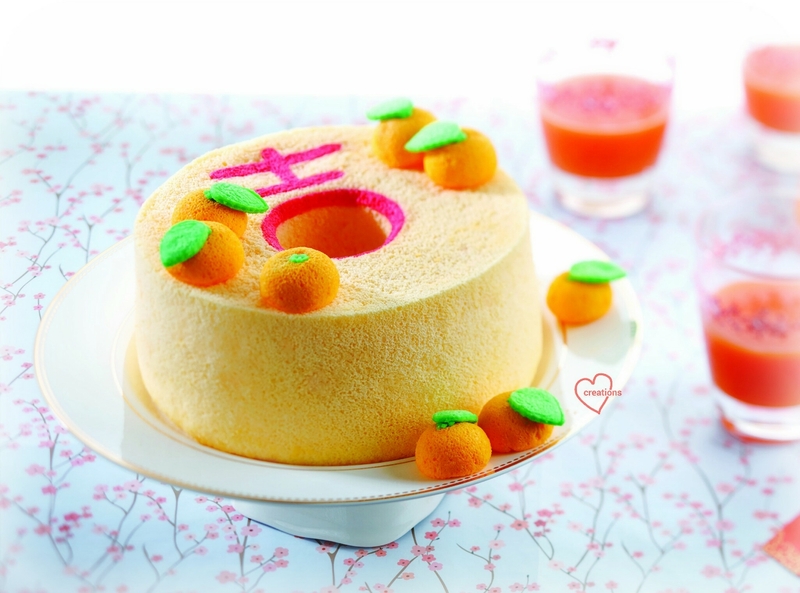 The original version used fresh mandarin oranges for decor, but when this cake was selected for the festive section of "Deco Chiffon Cakes" recently, we thought to use chiffon mini tangerines or "kumquat" for a full chiffon version. The mandarin orange chiffon recipe with picture tutorial of how to pipe the “吉” is now on Page 121-123 of my "Deco Chiffon Cakes". You can either add some cake flour (start with pinches) or add some meringue (1-2 tbsp) until you get a batter that doesn't run which you can pipe easily with. Make sure your piping batter is thick, at least 5-8mm thick so that it sticks on to your cake instead of the pan. Another reason why it gets stuck to the pan could be that you overbaked the pattern, so that it hardens and flakes off. Usually we bake for 1.5-2 min at 160°C but some ovens may be hotter. Make sure you do not underbake the pattern as well, if not it will break down while you are working with the main cake batter and you get a holey batter. Make sure that the pattern is dry at the surface after you bake it for 1.5-2 min. Just in case you want to try a plain mandarin orange chiffon cake recipe, the recipe is actually same as that of that of orange chiffon cake but using mandarin oranges, so you can substitute either one into the recipe. For the mini tangerines or "kumquat", I baked the mandarin orange chiffon cake with few drops of orange emulco in silicone cake pop molds. The calynx and leaves are from mini 'star' and 'leaf' cut-outs from green pandan sheet chiffon cakes. I use melted marshmallows to glue them together. Hope the above tips help! Looking forward to CNY! "大吉大利" to everyone! 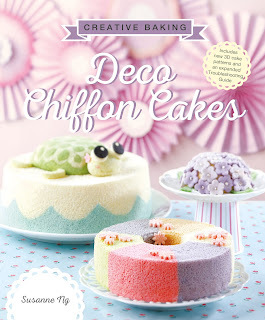 FYI many cookbooks including Deco Chiffon Cakes are on CNY promo at Popular bookstores now!